4 C 3 10th fretfr. 3 E 2 9th fretfr. 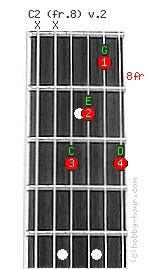 Chord C2 (8th fret) v.2 notes: C, E, G and D. You must leave out the 6th and 5th strings. Observation: C2 is not a standard chord symbol, but it's often used (incorrectly) instead of Cadd2/Cadd9 (the chord on this page), or Csus2/Cadd9(no3).